Before I got to know about my fellow BlackStar Roger Hamilton (who was actually one of the “idea makers” behind our BlackStar Group) – and about his form of wealth profiling, I must admit that I was struggling in my business! First of all I wasn’t really doing what I do best – and certainly not in the best way for me! As an accountant I had actually always been Networking – but only as a side-benefit to the accountant work = hard work all in all! – the work (and my life) flows MUCH EASIER!! Several (if not most) of my fellow BlackStars, has turned their business around, after taking the test – now working much easier/less, and often even making more money doing it! Knowing HOW to work yourself, is not enough though! You also need to surround yourself with the right people to team up with – people who is good at what you are not. Thats why we, in my BlackStar groups – team up with people with the other Wealth Profiles than our own. We then form BlackStar BoardRooms, preferably with members from each of the Wealth Profile Types – to ensure a dynamic group of optimal knowledge-sharing and support. – you can also find out WHERE YOU ARE on the Wealth Map – right now – and more importantly HOW to Progress!! 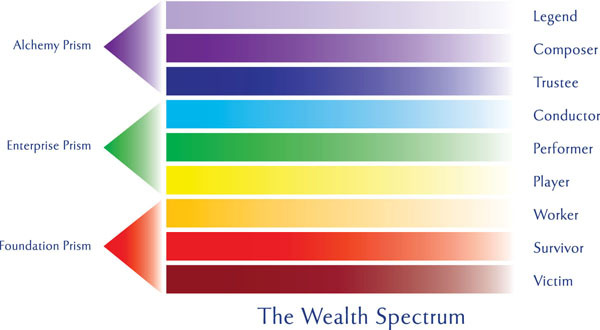 The Spectrum Test will show you where you are on the wealth map. Get an instant result and full report on the next steps to take based on your level. Save time, energy and money by getting clarity and certainty now. Avoid following the wrong advice or strategies – Know what to say no to. – and with WHOM !! I would love for you to share here, you personal success story on how you have changes your thinking, life and business – after discovering your TRUE FLAME …………….